SAR – secondary task capabilities as defined in the Company ERP. Vendor must be qualified according to the type of service required by the scope of work in accordance with the relevant procedures of Eni. Evidence of the Continuing airworthiness and maintenance organisation approvals for the offered aircraft. COMPANY will analyse the provided information/documentation and will determine whether or not it meets COMPANY’s requirement. This evaluation will be conducted at COMPANY’s sole discretion and Company will be under no obligation to disclose the progress and the results of this evaluation. Company shall contact the interested entities for any other information or documentation as may be specified in the Expression of Interest. COMPANY acknowledges that certain data or information provided under this quest shall be treated as confidential, if clearly expressed to be so by you, unless in public domain, and shall not be disclosed or communicated to any third parties except to COMPANY and Affiliates of COMPANY. This is not a bid invitation and, therefore, it does not represent or constitute a promise, obligation or commitment of any kind for COMPANY to enter into any agreement with any Vendor participating in this Eol. Please note that by participating in this Request for Expression of Interest, you agree and /or deem to accept (i) to bear all costs you might or will incur in connection with the preparation and participation in this process in general, whether or not successful in this process; and (ii) to defend, indemnify, and hold harmless COMPANY from and against any and all liabilities, damages, claims, demands, actions, losses, costs and expenses (including legal expenses) in respect of or arising or out of such preparation of this Request for Express of Interest. Based on the results obtained from the Eol, necessary qualification shall be undertaken in line with the Company’s Qualification Standard. 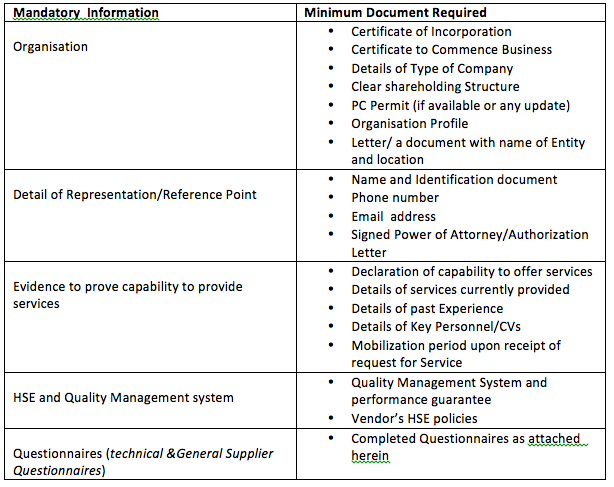 Based on aforesaid, your confirmation of interest to participate in planned tender(to be provided in the Bidding entity letterhead and signed by authorized representative) with all the additional mandatory information and documentation listed in point 2 and 3 above are expected to be received by mail, not later than CoB 28th February, 2019. Failure to respond to this notice within the above indicated time will not be considered.